A moving pop biography of the first man to swim the English Channel, by former BBC radio producer Watson. At 26, Captain Matthew Webb (1848–83) achieved what had been thought to be impossible. His 21-hour swim across the English Channel instantly earned him the status of a national hero, hailed by the press as “half man half fish.” Dazzled by his newfound celebrity, Webb resigned his commission with the Merchant Navy (where he had served with distinction since he was 12) and tried to earn his living as a professional swimmer. The monotonous spectacle of long-distance swimming, however, would not draw a crowd for long. His ensuing challenges—which he claimed were in the interest of advancing the sport of swimming—never matched the popularity of his channel crossing and became increasingly humiliating as Webb sought in vain to outdo himself. In America, he lost a race to his archrival Paul Boyton, who had crossed the channel two months before him in a bizarre life-preserving suit that allowed its wearer to fire warning flares and smoke cigars while rowing to safety. Eventually Webb returned to England, dropped the pretense of advancing the sport, and freely admitted that he was swimming only for money. His later feats (such as a river race in near-freezing water and a 60-hour swim in an aquarium) came to resemble freak shows, and they drew few spectators and little money. Webb reached the sad culmination of his career in the Niagara River, where he died during an insane attempt to swim the rapids above the falls. He left a wife and child behind. 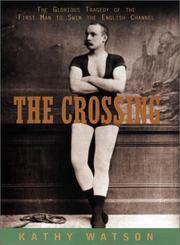 An absorbing account of courage, ambition, and early success—followed by a swift decline into desperation and tragedy.